Akamba is a fruit from Africa. It grows through out the continent from north to south. Besides Africa it also occurs in Saudi Arabia and Yemen. It grows at forest edges, in forests and woodlands, especially on rocky hillsides. A spiny, much branched, small tree, shrub or scrambler, up to 5 m in height, with a milky sap. Bark grey, smooth, young branchlets with or without hairs; spines simple, straight, 2-5 cm long, usually single. Leaves ovate to ovate-elliptic, opposite, occasionally almost circular, 2.5-6 x 1.8-3 cm, leathery, dark green above, paler green below, with or without short, soft hairs; lateral veins obscure; apex tapering, often with a bristlelike tip; base rounded to shallowly lobed; margin entire; petiole 1-4 mm long. 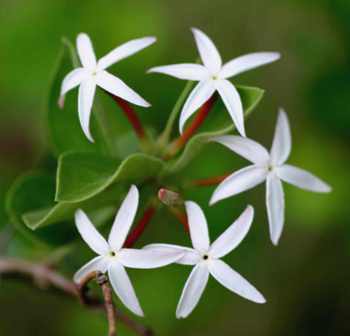 Flowers white tinged with purple, red or pink, up to 1.8 cm long, about 2 cm in diameter, slender, tubular, with corolla lobes overlapping to the right, sweetly scented, in terminal heads about 4 cm in diameter. 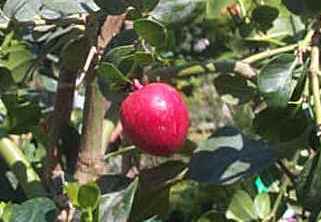 Fruits ovoid to almost spherical, up to 1.1 cm in diameter, red-black, ripening to purplish black, containing 2-4 flat seeds. Fruits are edible. The rounded berries, about 1 cm and purple-black when ripe, are The ripe fruits are sweet, although a little bit sour and taste like unripe cherries. dark red. The fruits are also made into vinegar after fermentation. The plant yields a very good quality fire wood. Parts of akamba plant are also used all over Africa to cure various diseases. Akamba roots contain a chemical ingredient carissin, which according to some researchers might turn out to be a potential cure for cancer. Akamba is not yet cultivated. The fruits are collected only from the wild. The plant can, however, easily be by seed. Seedlings can also be collected from the wild. It is, however, a slow growing plant. 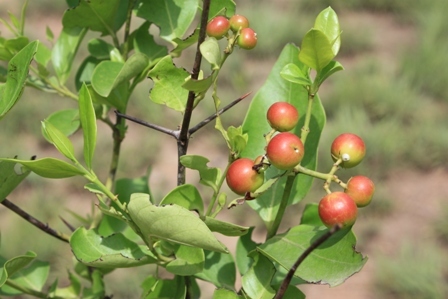 Akamba is an attractive tree that is suitable for planting in amenity areas. 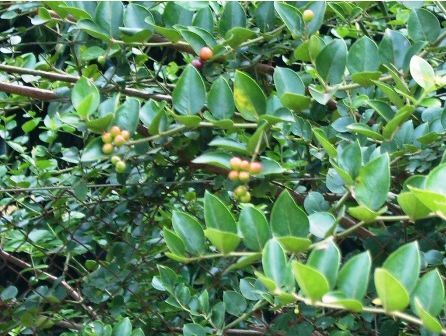 The abundant branching habit and the presence of spines make the plant suitable for planting as a protective hedge.